So between finals (aaahh) and packing up to leave for France for a week on a bike trip/wine trip with my family, I have been dissapointingly MIA on the blogfront. However, between all that craziness I did have time for a little vegetarian feast with my little sister, R, the family vegetarian/sustainable farming guru/all around awesome chica. I come bearing the most unbelievably delicious, perfect summer recipe! CORN PANCAKES! Yes…you heard right. 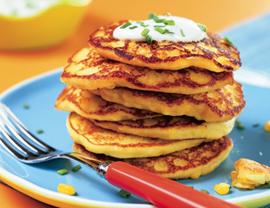 Fresh summer corn in a delicious pancake. What could be better?? Oh yea…and three pancakes are 110 calories and 4 g of fat. We ate them with a little greek yogurt and scallion on top, and then I had them the next morning with some honey, although maple syrup would be great too. And I honestly would eat them every day for the rest of my life if I could (they are THAT good). Combine milk, eggs and butter in bowl, and beat well. Sift together flour, sugar, baking powder and salt; fold into egg mixture. Fold in corn kernels. Let batter rest 20 minutes. Spray griddle or large nonstick skillet with cooking spray, and heat over medium heat. Pour batter onto cooking surface in 1/4-cup amounts. Cook until bottoms of pancakes are set and golden; flip over, and cook other side of pancakes until golden. Repeat until all batter is used up. Serve hot. This recipe is making me hungry – and I’m in Paris! !